" This is a place of learning for the people in creating quality theater works"
Jakarta Tourism and Culture Dept. allocates 700 free tickets to watch the Koma Theater performance at Graha Bhakti Budaya Building, Taman Ismail Marzuki, Cikini, Central Jakarta, Tuesday (6/3). 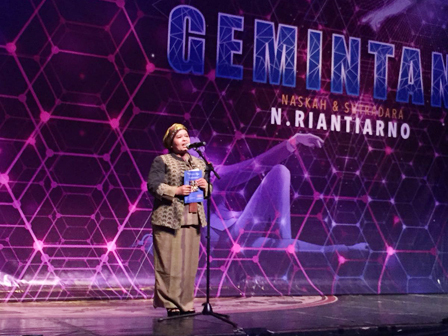 The theater that takes title 'Gemintang' will be participated by theater community, school students, collage students, and the public. Jakarta Tourism and Culture Dept. Head, Tinia Budiati stated it is hoped able to take the wisdom, lessons and messages conveyed in the plot of the story. "This is a place of learning for the people in creating quality theater works," he expressed, Tuesday (6/3). She explained, Koma Theater was chosen, as its theater is currently holding a theater performance. Then for the ticket budget is taken from APBD that is amounting to Rp 100 million. "Moreover it is a form of local government support for artists," he said.